Evelyn is my double rainbow baby. After 2 consecutive miscarriages, it’s easy to appreciate that I had a lot of tough emotions coming up early on in this pregnancy. Having already done the program & having access to all of the sessions early on, I was so thankful to be able to use my Hypnobabies tools right away. I used the Joyful Pregnancy Affirmations to stay positive and the “Special Place” Imagery to connect with my baby. The Fear Clearing session allowed me to remain in the moment and not let my fears get too far away from me in those early days. Then, when I was 27 weeks pregnant, my appendix ruptured. My Hypnobabies tools were an instrumental part of my recovery not to mention keeping my sanity during the entire ordeal. I used the Special Place Imagery over and over again. This session allowed me to check in on my baby and feel close to her & trust that she was safe (this was my go-to even while waiting for surgery!). In the hospital, I played the Deepening track every night to help me fall into a more restful sleep followed often by the Affirmations on a loop all night long. The Fear Clearing helped me release my fears and stay focused on my baby and my recovery. Also interesting for me was that whenever I used my “glowing orange hypno-anesthesia” in those early days (a Hypnobabies tool for anyone reading this who hasn’t taken the course…yet! ), instead of being orange at that time it was actually white which I interpreted as calming, soothing, healing and cleansing. Hypnobabies gives you tools for any curve balls life can throw! 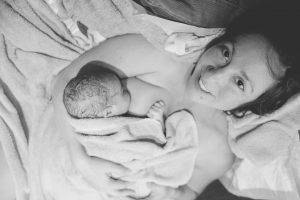 After a full recovery post-appendectomy, I was able to plan my home birth! When I got to 37 weeks, I had resolved to be prepared at any time; my first hypno-baby came at 40 weeks so I wanted to be ready ‘just in case’ this baby decided to come a bit earlier. The weeks passed and by the time I got to 41 weeks, I was convinced my birthing time had to be any day. But no… this baby had her own plans. My amazing midwives were happy to continue supporting me as long as it took and even agreed to support my home birth plans past 42 weeks if it came to it (as long as both baby & I were doing well of course). I especially loved listening to my sessions every evening in those final weeks – it was a chance for me to stop and just be with “this” baby after long busy days focusing on the rest of the family and juggling all of life’s demands. My hypnosis also helped me manage stress and stay connected, trusting that my birth would happen when & how it needed to. There were many days where I would do as many as 3 sessions in one day! As I sailed towards 42 weeks, I had agreed to regular post-dates monitoring to check in & make sure that baby was still happy. A few days before 42 weeks, we learned that my amniotic fluid was low. We sat on this for a couple of days and then, facing a consultation with our local OB at 42 weeks & the possibility that we’d be changing our plans to a hospital birth as well as discussing medical induction, we made an informed decision to try a few natural induction techniques to see if we could encourage this little monkey to make her appearance! The Hypnobabies Fear Clearing session as well as My Special Place & even the Birth Visualization sessions made making these decisions easy – I was able to remain calm, happy and open to whatever birth my little girl needed. On July 26th, at 41 weeks & 6 days, following some monitoring to check in on baby I agreed to a sweep of my cervix. I went home and rested for a bit before we made something called an “induction cocktail” recommended by my midwives. To help things even further, within the hour of taking the “cocktail” I was at my acupuncturist’s house getting a treatment while she fed her family dinner! I went home and had some dinner myself then played with my son & a couple of hours later, my husband took over bedtime duty & I went to see my dear friend & doula, Kimberly. We then spent the next hour+ walking. This is when my pressure waves really started: it’s funny looking back now because I was in denial that things were actually happening at the time. I think I had spent SO LONG waiting to meet this little rainbow that I couldn’t quite wrap my head around actually setting eyes on her. By the time I got home, I immediately had another wave at my front door & noted the time (9:29pm). I went to the bathroom where I had yet another wave & FINALLY thought “maybe I should time these” – they were already 2-3 minutes apart! My husband came and found me breathing through the waves and, being the great partner that he is, he immediately started in supporting me with my Hypnobabies cues. I was already focused and imagining my anesthesia flowing all around my baby with each wave but his touch (Relax Cue – a deepening technique) & verbal prompts just made it all that much easier. My husband asked if he should call Kimberly & I remember telling him that it had to still be too early (I had JUST left her about 20 minutes before!). Then I had another wave as I was saying this and that’s when I realized just how powerful these waves were & he was given permission to make the call. As we were waiting for her to arrive, with the waves coming one after another, I then remember him asking if we should just call the midwife and AGAIN, my reply was that it was too early yet … then changing my mind again after the next wave! I still couldn’t wrap my head around the fact that we were actually going to meet our daughter… let alone how close we actually were to this!! I used my Hypnobabies Light-switch with every wave and pretty much kept my eyes closed the entire time focusing on my Special Place (connecting with my daughter), imagining my body soft and relaxed (especially my face) and just breathing through each wave with my PEACE Cue. I remember hearing the team starting to assemble (everyone came pretty quickly) and by shortly after 10 pm, everyone had arrived. I got a break between waves and quickly moved downstairs to my birthing suite where our final home birth preparations were already taking place. My midwife asked to check me once we got downstairs & I consented to a vaginal exam – I had asked not to know details, so my midwife very helpfully only told me there was “lots of change” happening & I went right back into focusing. We had my birthing guide “Easy First Stage” playing out loud and I remember during the waves finding Kerry’s voice to be so calming & grounding. It really helped keep me focused. Of course my team (doula & hubs) were also amazingly supportive with both my physical and verbal cues. My birth pool was filling and I remember moving to the side of the pool sitting on the ball for a bit when I suddenly got an urge to push! It surprised me – I even asked out loud if it was OK! If you’ve read my first birth story, you’ll know that my son took his sweet time so to be there already was a bit shocking to me to say the least! I think it surprised everyone actually because my husband had been given the ok by the midwife to run upstairs for a quick shower and we then had to send someone up to get him! As if by magic, my birth pool happened to be ready then and I was given the ok to get in. This is when I started to really feel pushy… not long after, my body just completely took over and after only 2 pushes and 14 minutes, my sweet baby girl was in my arms. Evelyn May was born in the comfort of my home, surrounded by love after a speedy 2.5hrs of birthing, one minute shy of 42 weeks, one minute after our second midwife arrived & in the caul (with the amniotic membrane still intact – it broke AS she came out… pretty much exactly as I had imagined). I think it’s fair to say that we got off to a rocky start but, it was the birth I had envisioned in the end (including the midwife I was secretly hoping for – also a hypno-mom!) & I am so grateful for the ridiculously amazing support I received, as well as of course my Hypnobabies tools: I honestly could not imagine doing any of it without Hypnobabies!